Take your pick. Any stick. This 360-degree, versatile freestanding hockey stick display was built for the middle of a hockey superstore. This particular display is held up by a lightweight steel frame and also features multiple vacuum formed bases for easy transportation. Sticks are separated by style and size with convenient informational graphics along each section of the display. Like skates, there are so many options when shopping for a new hockey helmet. 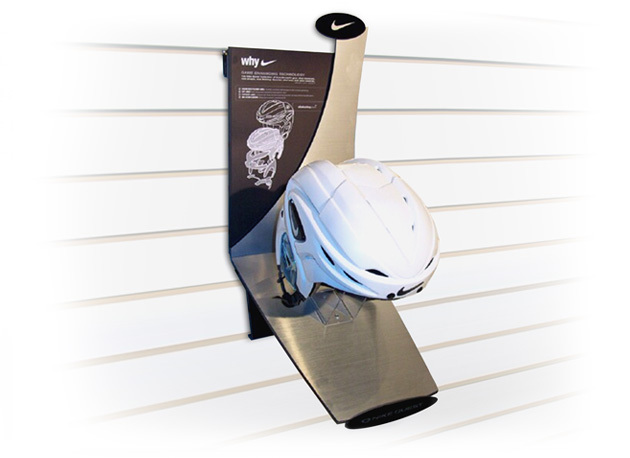 These two unique Nike Hockey displays were inteded to separate the Nike helmets from the rest. Features include bright eye-catching logo header graphics, three sides for product showcasing and one full-length inspirational graphic. Outlets may chose from a roll-about space conserving option, ideal for an aisle end cap. Or, they might go for a wider, wire racking-style display. Either way, consumers are given plenty of reason to skate with Nike. New approach to a classic display. 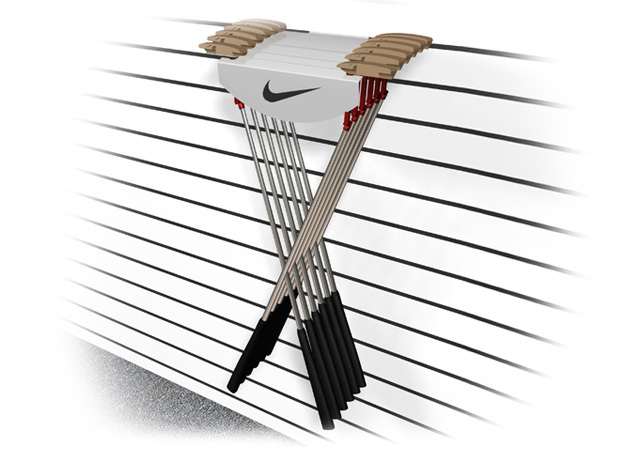 This slatwall merchandiser was designed to use a ‘criss-cross’ style product placement to separate Nike putters from the rest. 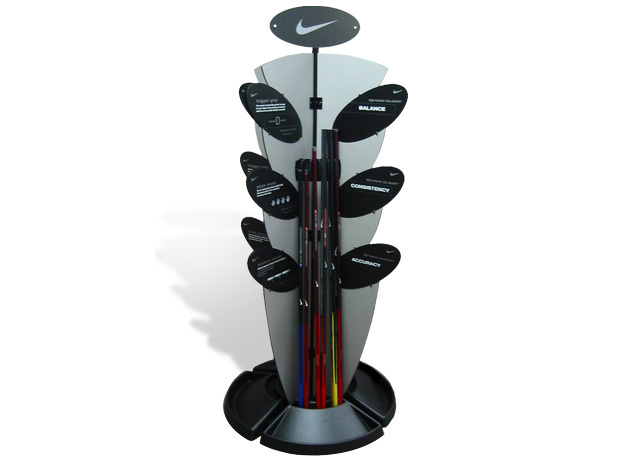 A large Nike logo on the front of the wooden putter holder puts the brand front and center. Rather simple construction allowed for easy set up and cost effectiveness. See both sides of every shoe. Most shoe stores have largely one-sided shoe shelves and displays. 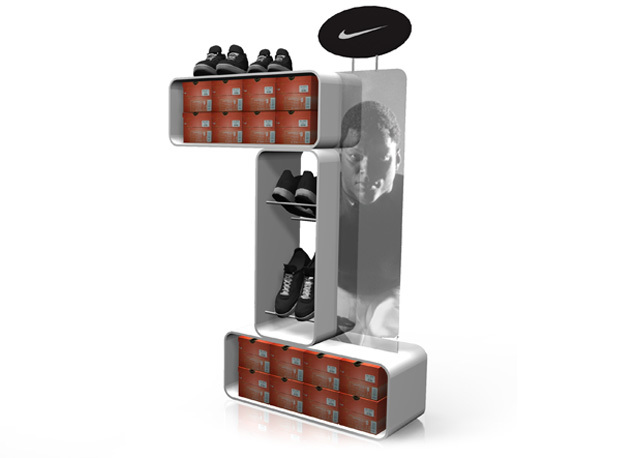 With this shoe display we worked to make a dual sided display showcasing the same variety of shoe. With dual sides, the shoe has twice the chance of catching the eye of a customer. Display also features transparent side graphic and ample boxed product storage. Never in line with the competition. 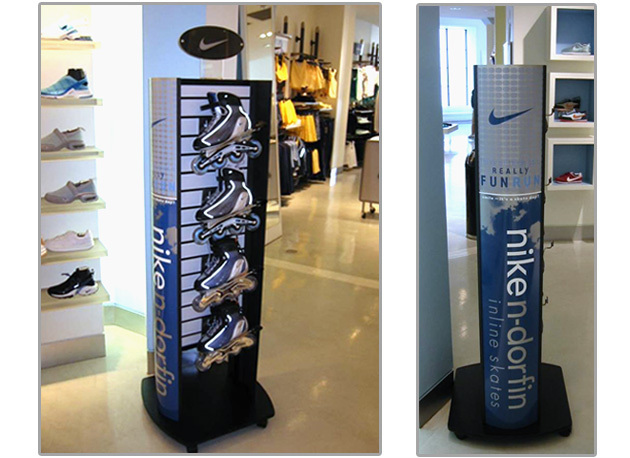 For Nike’s n-dorfin inline skates, they were looking for a roll-about display that differentiates their product in the footwear section of sporting goods stores. We developed a two sided free-rolling display with dual sided slatwall and interchangeable side graphics. This allowed for eight different inline skates to be showcased on one display. As hockey players of all ages know, most skate shops offer many different brands of skates for sale. 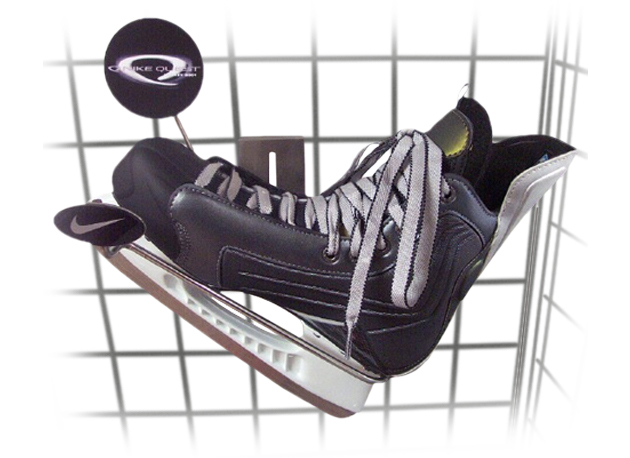 Most are sold on uniform skate holders that hook into wire backing or slatwall. Nike wanted to differentiate the Nike Quest skate line from the competition. 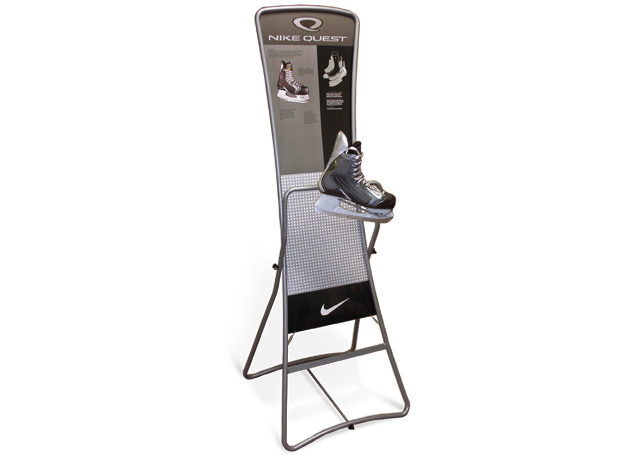 So, we developed a custom angled skate stand that features the Nike and Nike Quest logo on two distinct graphic plates. The result was an simple grid skate holder that stands out nicely in hockey stores around the world. 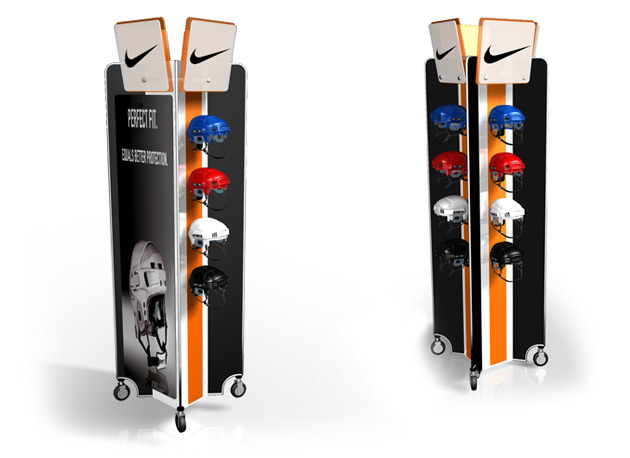 Once again designed to hook into slatwall, this stainless steel display features informational graphics pointing out the state-of-the-art safety features in new Nike helmets above a basic holding bracket showcasing the product. 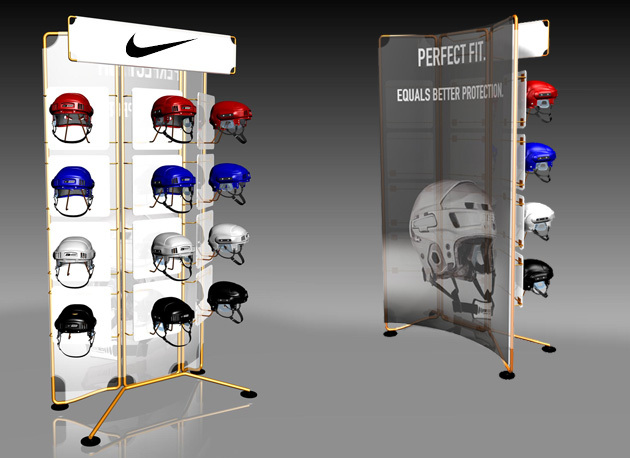 Our Nike Quest display is one of the most versatile displays we’ve designed to date. This particular display features the Nike Quest hockey skate line. A small bottom rack option and interchangeable graphics allow for Nike Quest hockey sticks to be placed on the display as well. Simple steel tubing structure makes this display extremely lightweight yet very durable.